Microbes -- those living, single-celled organisms too small for the naked eye to see -- could end up doing some mighty big things for the University of Wyoming. Over the next five years, UW researchers are taking an up-close look at those unseen organisms at an unprecedented scale, thanks to a $20 million, five-year grant from the National Science Foundation (NSF). And using cutting-edge techniques including DNA sequencing and computational modeling, the scientists hope to learn the distribution and ecological consequences of microbes, producing insights that will help Wyomingites address a variety of challenges -- from managing rangeland, forest and water resources, to reclaiming areas disturbed by mineral extraction, to improving crop productivity. In the process, the university expects to stimulate significant economic and business opportunities across the state -- and engage people from elementary school pupils to community college students to business leaders in scientific discovery. The grant was among five announced last September through NSF’s EPSCoR (Established Program to Stimulate Competitive Research) program, which supports efforts to enhance research, science and mathematics education, and workforce development. The award comes on the heels of another five-year, $20 million NSF grant in 2012 -- at the time, the largest research grant in UW history -- that stimulated wide-ranging research into Wyoming’s water resources. While the grant officially began Sept. 1, 2017, the actual fieldwork has ramped up this summer, with no fewer than eight UW professors heading projects supported by postdoctoral researchers, Ph.D. and master’s degree students, and new equipment -- all funded by the grant. Microbes include bacteria and fungi, archaea and very small animals, including worms. Microbes can stimulate plants to grow faster. Wyoming is ideal for research of this nature and scope because of the variety of its lands, including elevation, temperature, moisture and land use, the researchers say. Rapid changes in elevation and soil type often occur over small distances, and these steep gradients will give scientists an excellent window to study the variety of microbes and their functions. Wyoming also provides unusual access to pristine lands and waters, as well as systems disturbed by resource extraction, dams and water diversions. -- Cynthia Weinig, a UW professor in the Department of Botany, leads a project to research how microbes, especially bacteria, interact with native plants. One of the interesting questions being studied is, “How do microbes influence the circadian clock?” Ewers says. -- Alex Buerkle, a professor of botany, is studying the spatial patterns of the biogeography of the microbes. Biogeography is the study of the distribution of species and ecosystems in geographic space and through geological time. Joshua Harrison, a postdoctoral researcher with Buerkle, is traveling the state, including the Wind River and Big Horn mountain ranges, to sample microbes to determine what their spatial distribution is and how that might relate to the geology, elevation and the types of plants that are found at certain locations. -- Naomi Ward, an associate professor in the Department of Botany, in concert with the Department of Anthropology, is studying microbes associated with a mammoth dig near Douglas. Specifically, Ward wants to learn whether there is a particular set of microbes associated with these deeper sediments with the mammoths that are separate from what else is being found in the state. -- Linda van Diepen, an assistant professor in the Department of Ecosystem Science and Management, is researching invasive plants, including cheatgrass, and what the microbial communities associated with those invasive plants may be. “Are they similar or different to what we see in the native communities they are invading? And how might those microbial communities change with the kind of management treatment to deal with those invasive plants?” Ewers says. -- David Williams, a professor and head of the Department of Botany, is looking at the relationship between microbial communities and the types of isotopes found in those communities. Some of the research will look at the relationship between snowpack and associated microbes, and how that sets up microbial communities for the growing season. -- Bryan Shuman, a professor in the Department of Geology and Geophysics, is researching lake sediments and whether microbial communities in those lake sediments are similar to microbial communities around the lake or whether they come from dust. -- Franco Basile, an associate professor in the Department of Chemistry, is using a new $750,000 mass spectrometer instrument funded by the grant to take extremely high mass precision measurements of metabolites, which are a collection of small organic molecules that are a part of an organism’s metabolism. Sugar is one example of a metabolite. When a blood sample is taken, you want to know how much sugar a person has cycling through his or her blood, Ewers says. The same can be done with microbes or microorganisms in plants and soil, he adds. 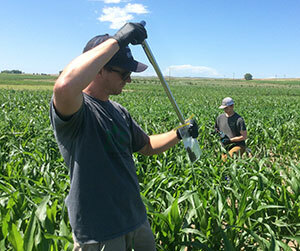 -- Shannon Albeke, an associate research scientist and ecoinformaticist with the Wyoming Geographic Information Science Center, leads a team of researchers who are putting together a barcoding system to keep track of the thousands of microbe samples that are being collected around the state. This highly interdisciplinary award brings together researchers and educators from multiple UW departments. The grant also will bolster the number of UW faculty numbers by three and provide for 10 postdoctoral researchers and 10 Ph.D. or graduate students each year of the five-year grant. The new faculty will specialize in computational biology in the Department of Botany; plant microbe interactions in the Department of Molecular Biology; and biogeochemistry in the Department of Geology and Geophysics, Ewers says. The grant includes funding to purchase computational nodes and storage from the Mount Moran campus cluster that is part of UW’s Advanced Research Computing Center. All of the code will be tested, and analyses will be conducted through Mount Moran, Ewers says. “Then, when we need to ask questions requiring more computation, we’ll ladder up and use the NCAR-Wyoming supercomputer in Cheyenne,” Ewers says. A crucial part of the computation will be training personnel through the creation of a Data Science Center at UW. The center will help educate and provide tools for high-performance computing for undergraduates up through faculty, and it will create unprecedented opportunities for students to engage in the cutting edge of genomics, the study of the entire DNA sequences of organisms and statistical analyses -- crucial components of the contemporary growth in the economy related to life sciences and data science. The grant will provide opportunities for community outreach as well. The “pipeline” of sample collection, storage and analysis will involve UW and community college students, K-12 teachers and others. Members of the Northern Arapaho and Eastern Shoshone tribes will be trained in sample collection and laboratory and statistical analyses of microbiomes from the Wind River Indian Reservation. This work by the two sovereign tribes will not only answer new questions about land management, but also aid in economic development.